Currently, the industry commonly used aluminum sheet coloring natural coloring, electrolytic and chemical coloring coloring and resin powder coating method. 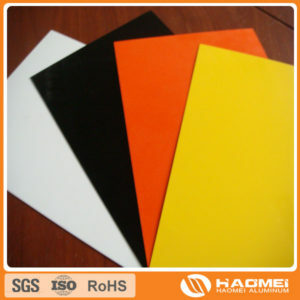 Aluminum sheet chemical coloring is called dipping coloring, which is early foranodized aluminum sheet coloring methods. Chemical mechanism is based on a porous film like woven fabric as dye adsorption capacity, the dye in the water into a single molecule separated, coloring, the dye is adsorbed to the surface of pores in the pore diffusion, accumulation, and alumina and a chemical or physical action leaving the colored film, by sealing treatment, the dye is fixed within the pores. Aluminum sheet chemical coloring process is simple, high efficiency, low cost, less investment in equipment, coloring domain wide, bright color, and so on. However, a large area of products prone to uneven color, coloring after cleaning, improper sealing or mechanical damage, it is easy to fade, poor light fastness of the colored film, it is generally used as interior decoration, with a small aluminum sheetproducts daily coloring treatment.